GEOTECHNICAL EQUIPMENT GEOTECHNICAL EQUIPMENT DYNAMICPENETROMETRIC TESTSIN A PORTABLE DEVICE The DPM30 penetrometer allows continuous dynamic penetrometric tests to be performed. The fact that it is exceptionally small means it can be USED ON SITES THAT ARE INACCESSIBLE TO NORMAL MACHINES A hydraulic extractor is used to extract rods, casing tubes and samplers. The penetrometer is controlled via a pedal-operated distributor. THE HYDRAULIC CONNECTIONS ON THE VARIOUS COMPONENTS USE QUICK CONNECTORS. Reliability proven by hundreds of units operational around the world. 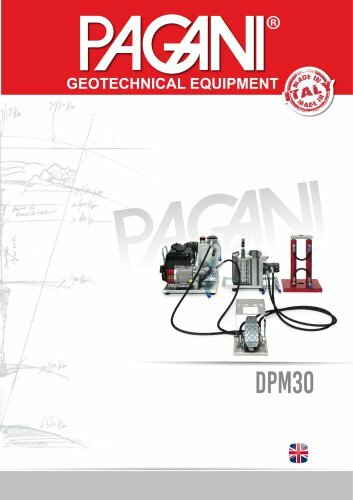 GEOTECHNICAL EQUIPMENT www.pagani-geotechnical.com Pagani Geotechnical Equipment Srl Loc. Campogrande 26, 29010 Calendasco (Piacenza) Italy Tel: +39 0523 771535 - Fax: +39 0523 773449 info@pagani-geotechnical.com Non-binding data, with right to make changes. The diagrams may differ from the standard version. The equipment may differ depending on which country it is being shipped to.